The Mega Joker Slot Machine is a lot of fun to play online because it is styled after the traditional fruit machines, but with new twists. This three-reel, five-payline machine only looks traditional – the inclusion of a progressive jackpot and two distinct bonus games gives it a modern flair that will keep players hooked on the action. You can play Mega Joker slot for real money in one of the casinos that we have listed below or you can just play it for free here, on Slot Machines Online. 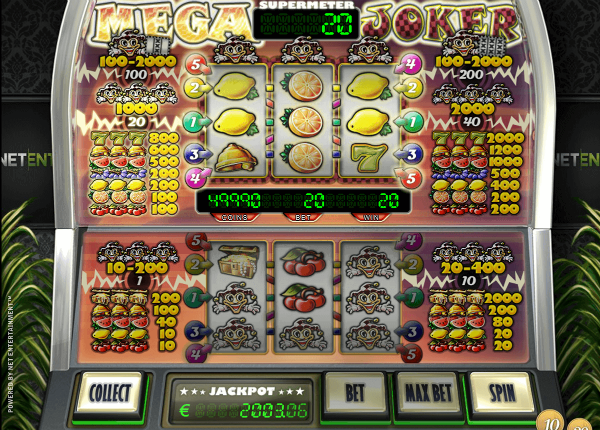 Like all traditional fruit machines, the Mega Joker slot machine uses the classic symbols of days gone by – lemons, cherries, melons, and number symbols. The inclusion of a Joker symbol isn’t just good for the gameplay (players can earn big bonus rewards by lining up certain combinations of Jokers and regular symbols), it adds to the antique feel of the game. Mega Joker slot is powered by NetEnt software and features two sets of three reels – the bottom set is the regular one, while the top 3-reels are used for Supermeter bonus mode. Super Meter Mode – In this mode, play switches to an upper screen that operates according to different rules. This bonus is triggered by aligning three symbols on any active line. In this mode, players may only bet 20, 40, 100 or 200 coins, and all five lines are activated for each free Super Meter Mode spin. Prizes in this round range from 100 to 1,000 coins. Mystery Prizes – The amount of this bonus is random (between 1 and 4,000 coins) and is triggered by the appearance of three Mega Joker symbols on any active line. Multiple lines of three Mega Joker symbols mean multiple mystery bonus prizes. Mega Joker Slot machine has 4 control button plus additional button for the coin value. Coin value: the value button appears at the bottom right corner of the game and has three options: 10, 20 and 1. Choosing 10 will set the coin value on €0.10, 20 will set it on € 0.20 and 1 will set the value on €1. Collect: Banks the amount from the Supermeter and takes you back to regular play mode. Bet: while in the regular mode it changes the bet size from 1 to 10 coins. During the Supermeter mode it changes the bet size between 20, 40, 100, and 200 coins. Max Bet: sets the bet on the maximum 10 coins and spins the reels. At first sight, the Mega Joker slot machine may look a little like something from the past, but the inclusion of a progressive top prize, 2 sets of 3-reels and additional bonus games (not to mention the wild Joker symbol) makes it a perfect classic slot machine for modern audiences, as well as the old-timers between us. Mega Joker slot machine is not a typical online slot and for me, it’s exiting to see this type of Vegas-style slots make their way to online casinos.